College Tour: Art Center College of Design – art. college. life. 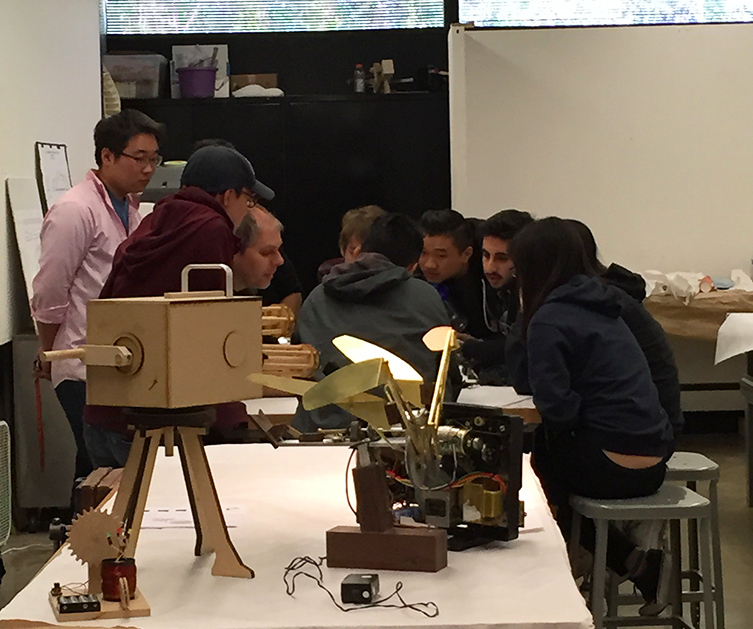 In early April, I toured the Art Center College of Design in California. Set in a single modernist Ellwood-designed building that spans a ravine in the hills of Pasadena, the aptly named Hillside Campus is a visual study in contrasts. Harsh steel and glass are surrounded by eucalyptus trees and fragrant sweet jasmine. It’s difficult to gain acceptance into this selective school, often ranked at the top of many college search lists. The reward for getting in is hard work and readiness for the real world. As one admissions representative said, “you’ll never work as hard in industry as you do here.” Kit Baron, Senior Vice President of Admissions explained the reasoning behind the schools demanding curriculum and structure, tying it to the college’s core mission. Art Center “was founded not as an atelier but for industry, to listen to what client’s want,” she said. Translation: the school educates and helps students transition into the job world. An example of the school’s strength is their Transportation Design program, which is constantly ranked #1 internationally. That stellar rating is reflected in the fact that every major automotive manufacturer has had an Art Center alum as a design chief or leader. Think about that; every major automotive manufacturer. Beyond transportation, Art Center has 10 other undergraduate programs leading to BFA or BS degrees. Students are guided and challenged by approximately 400 faculty members, most of whom are also working artists. Classes are taught on the semester – or term – system, with three terms per year. A completed degree is based on eight terms, which means that students can graduate in fewer than three years. Most don’t though, typically taking 4–6 years to complete their education. There is no foundation year here, meaning students must be focused when they begin, but they’ll get to spend more time dedicated to their majors. The smartly and strategically structured Illustration Department is the largest on campus. Five tracks exist within the department, directing students towards entertainment arts, motion, design, fine arts, or surface design. Each has a unique focus, requiring a different set of skills to work in their respective industries. One of the hottest new majors trending across the country right now is Interaction Design, and Art Center has it. New due to our tech-focused world, it’s the study of apps and interfaces. Beyond the Ellwood building and adjacent Sinclair Pavilion for relaxation, there isn’t much else to this campus, reinforcing the focus on creating art. Students live down the hill, in off-campus apartments. A short drive away is South Campus, where Fine Art and Illustration students study, alongside graduate and community programs. The school’s long-range plan includes building dorms there in three years. Art Center is not for the indecisive or inexperienced. Applicants already have a defined proficiency and a sense of direction. Prospective students apply directly into a major. The college accepts students on a rolling basis with just a few admissions deadlines. ← Pre-College Art Programs: Sign Up Now!